Thick and fiery, sambars are the first course in any South Indian meal. Serve them steaming hot with plain cooked rice, vegetable accompaniments and pappadams, either fried or roasted. A dollop of bubbling ghee adds a flavour of its own. 1.Heat 2 teaspoons oil in a heavy frying pan or skillet. 2.Add fenugreek seeds,6 red chillies, hing, cumin seeds, coriander seeds, channa dal and poppy seeds. 3.Saute for 2-3 minutes. Blend to a fine paste in a mixer along with grated coconut adding very little water. 2.In a pressure cooker add 2 cups of water, turmeric and dal cook it for 3 whistles. 3.Set the cooked dall aside. 5.Heat 2 tbsp oil in a heavy saucepan. Add the mustard seeds, cumin seeds, fenugreek seeds, halved red chilli, and few curry leaves. 6.When the mustard seeds splutter, Add pearl onions. Saute over a low heat about 5 minutes. 7.Add tamarind Juice, ground turmeric and salt to taste. 8.Cover and simmer for 5-7 minutes until the raw smell of tamarind disappears. 9.Add cooked dal and masala paste. Cook for another 5 minutes until thoroughly blended. 10.If the sambar is too thick, adjust the water and bring to the boil. 11. 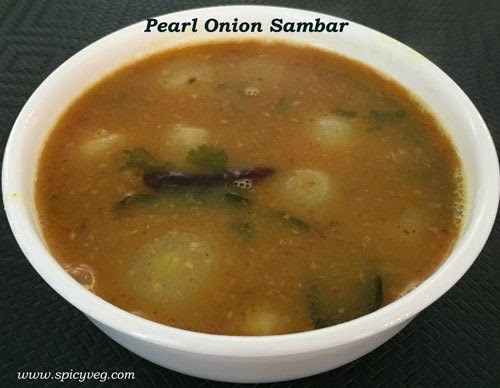 Garnish with Finely chopped coriander and serve with steamed rice ,pongal ,Idli or Dosa.